When the clock strikes the hour or half-hour the door opens, a cuckoo appears and calls along with the clock’s gong strike. After the cuckoo calls, music plays from the symphonic music-box mechanism made in Switzerland. This clock is hand made in the Black Forest in Germany. The mechanical brass movements are driven by three weights and time escapes with the tick of a traditional pendulum. 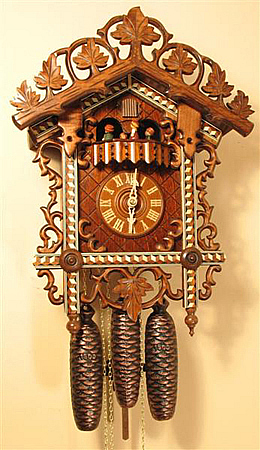 The cuckoo call sound is made by two wooden whistles with bellows inside the clock case. Even the packaging has old-world charm, as only paper is used. The factory packing is all made with recycled materials. This clock makes a great gift for the young and old alike. Perfect for modern or traditional decor!